Living atop the Mount of Olives we have a breath-taking view of the city of Jerusalem: Wadi Joz and Sheik Jarah just below us, the old city a bit to the south, and West Jerusalem further to the west. Our forty minute morning walk to Redeemer Church in the midst of the old city (Fred five days a week & Gloria twice a week) is a daily reminder of Palm Sunday and Good Friday. The Gospel texts are engraved on the stones and acted out among the people we encounter along the way. 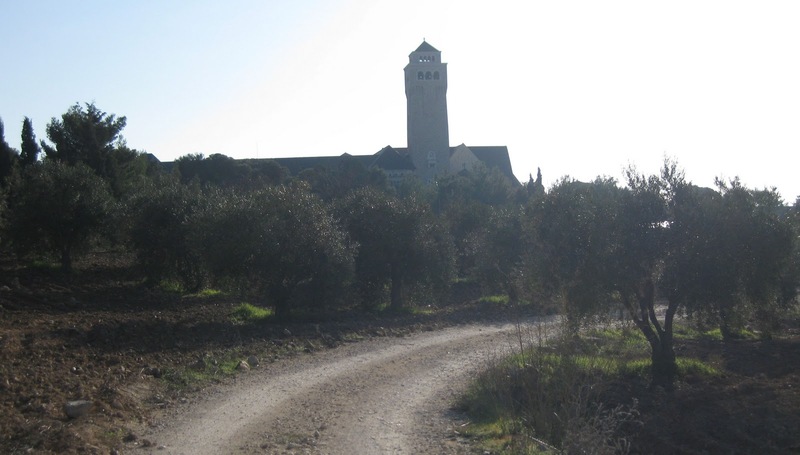 Heading first into the sunrise, we look forward to our Easter Sunrise service on the hillside beyond the Augusta Victoria Church of the Ascension. Through the olive grove we wind our way to the street. The street, intersecting the LWF campus, heads south along the crest of the hill toward the Orthodox Church of the Ascension in the distance. The view west across the valley toward the Old City. 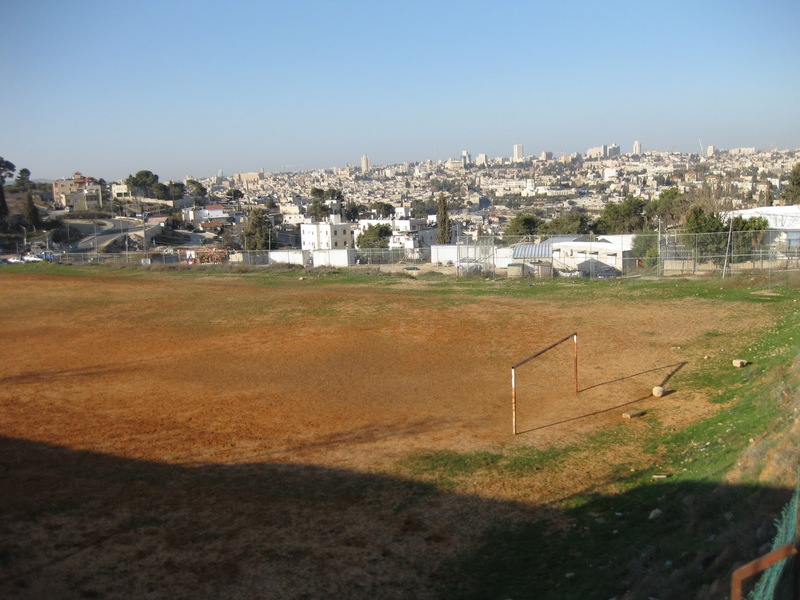 The LWF football field is a gathering place for East Jerusalem youth. Plans & funding are ready for improvements to make this a Class A sports facility, but the municipality must give approval and that doesn't come easy. 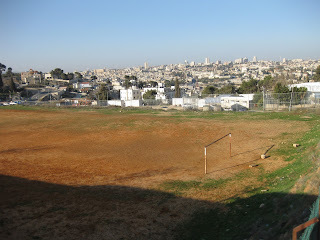 Just beyond the field can be seen the white caravan trailers of the newly expanding Jewish settlement. With the passing of each day, the elusive peace seems buried more deeply under concrete and rock. The same day the settle- ment freeze expired, the Israeli govern- ment okayed 24 new apart- ments. So settlement construction has gone on non-stop including a visit of public support by Mike Huckabee, laying the cornerstone. 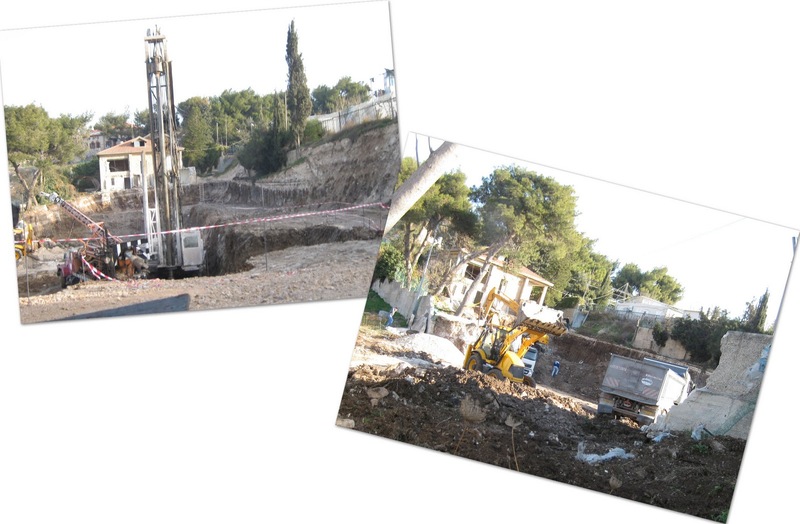 In the meantime, the years long wait continues for building permits for the Augusta Victoria Housing Project. In the meantime Palestinian homes demolitions occur on a regular basis. And so even a downhill walk seems uphill. 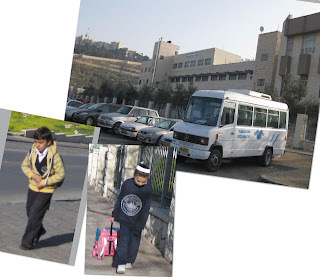 Further down the hill we meet dozens of Muslim children with backpacks heading to the Ibrahim School and college. 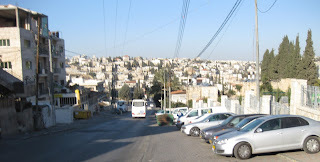 Up the hill and to the left in photo is Hebrew University. The Kidron Valley separates Mount of Olives from the old city. 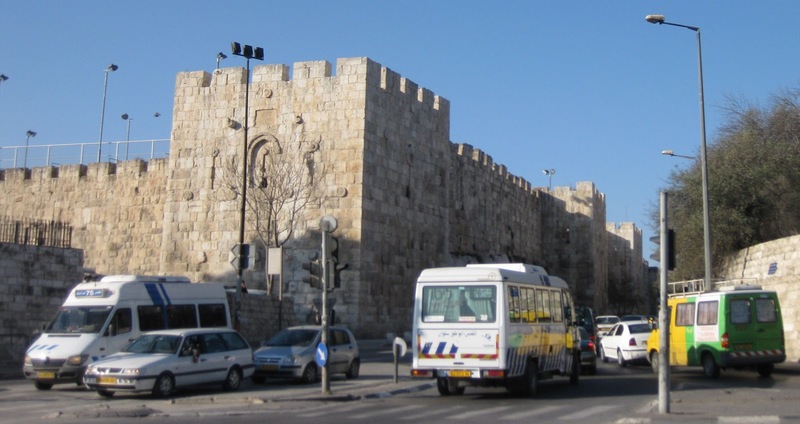 At the very left, the Dome of the Rock peaks out above the city walls. 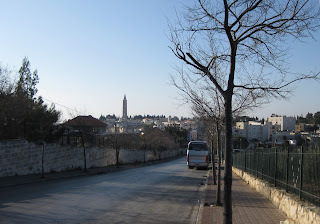 Down from it and left of the photo is Gethsemane. The downward journey turns into an uphill climb toward the Rockefeller Museum with its tower rising above the horizon. At the top of the hill we reach the Northeast corner of the city walls. After a few minutes we come to the main East Jerusalem shopping center with Salahadin Street heading north from the Old City. 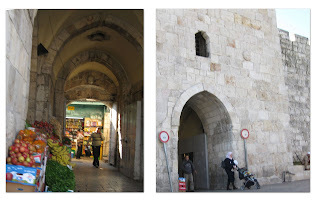 Herod's Gate leads us into the Muslim Quarter of the Old City. 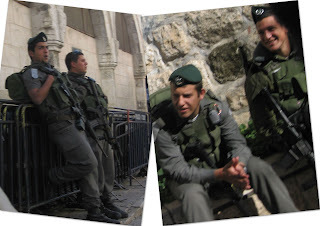 A welcoming party of two Israeli soldiers stands inside the gate to check IDs of every Palestinian male between ages of 18 to 30. On Fridays, when noonday prayer brings crowds to Al-Aqsa mosque, men under the age of 50 are not permitted and Fred sometimes has to show his ID. 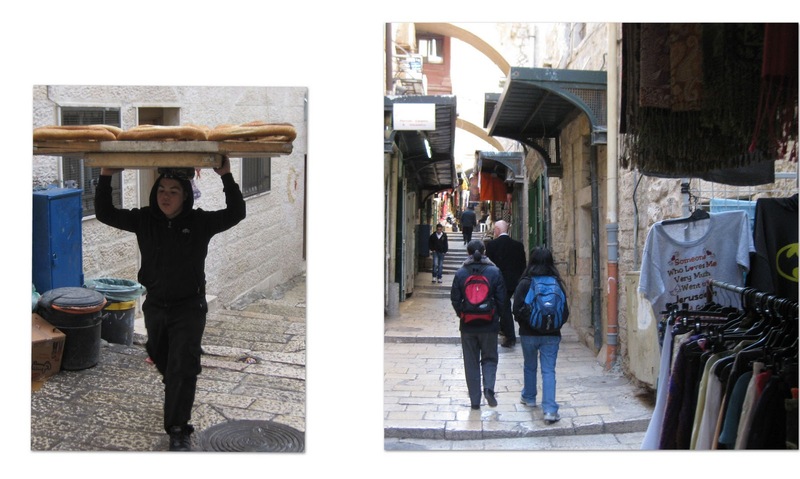 In the early morning we en- counter children on their way to school or boys deliver- ing fresh baked bread to stores from the neighborhood bakery. 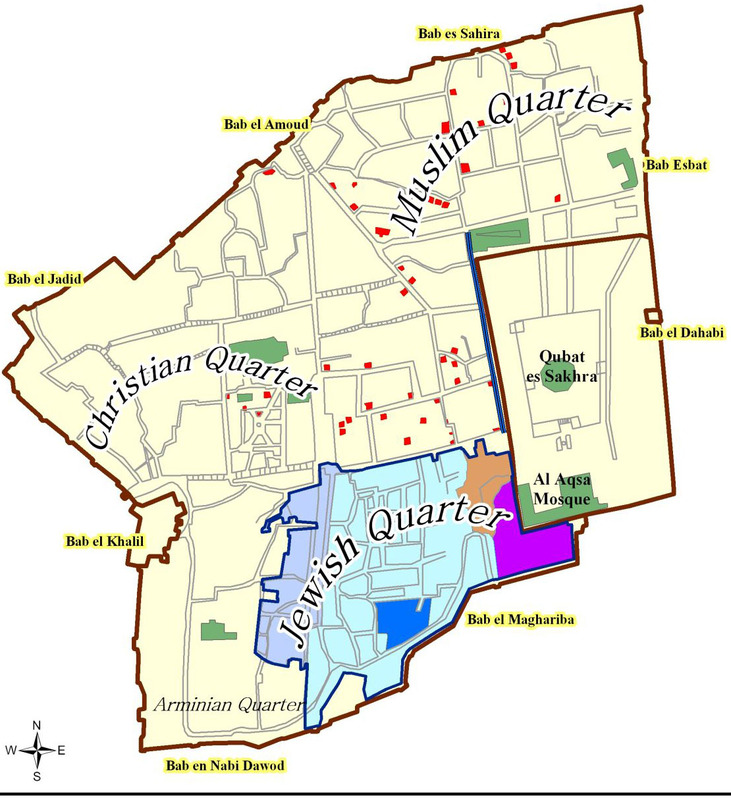 Our destination is the Lutheran Church of the Redeemer located on the map by the green marking just under the "er" of "Christian Quarter." From Herod's Gate (just above the "Q" in "Muslim Quarter") we zigzag our way through narrow streets. On the map, the red dots all represent Jewish settlements established in the Old City over the last two decades. 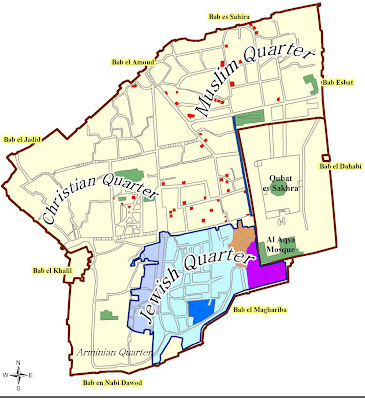 As you can see, most are in the highly populated Muslim Quarter. 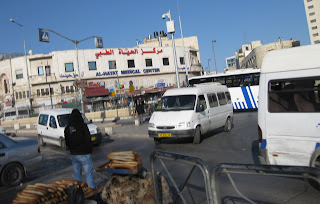 The building below on the right (just above the small "m" in "Muslim Quarter") was occupied by settlers about five years ago when the Muslim residents were away attending a wedding. 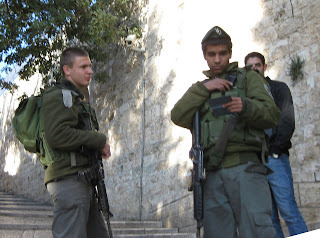 Their own armed guards make sure the previous residents will not return. 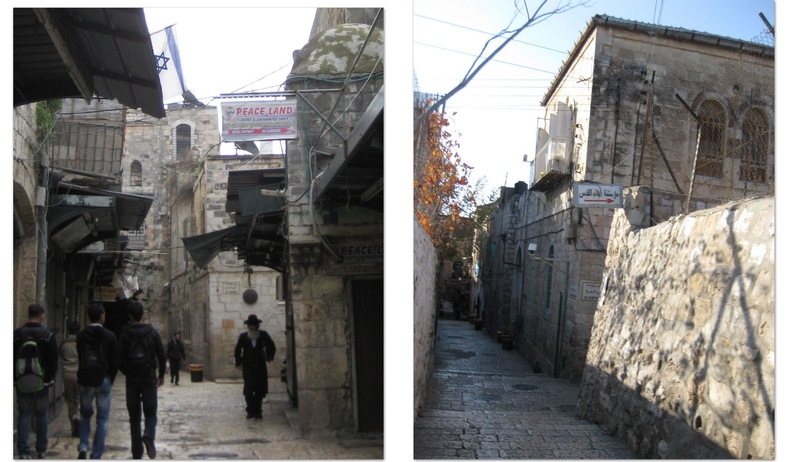 The photo on the left shows the area below the capital "M" in Muslim, with an Israeli flag reminding all the neighbors who occupies this house. Notice the security cameras in several directions at the top of photo below. 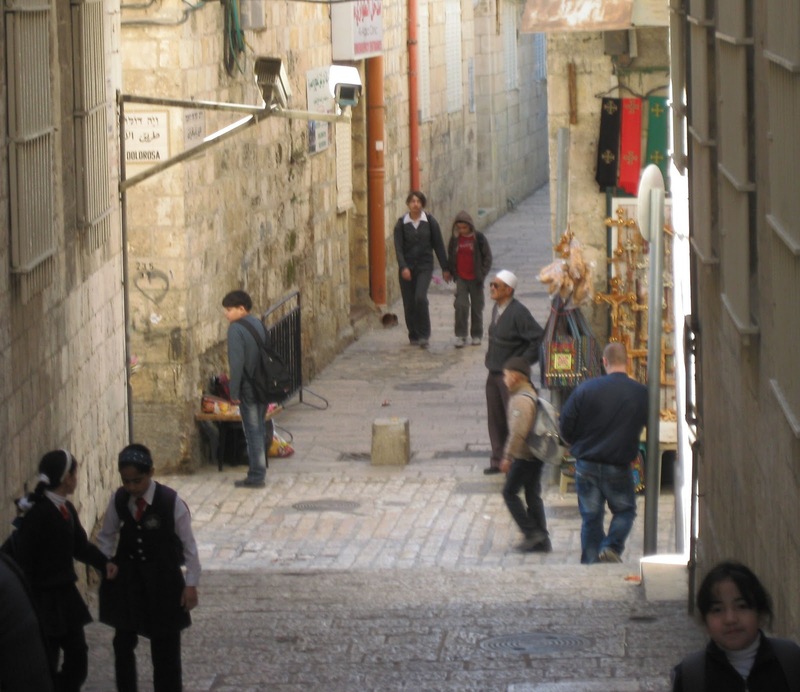 Near the Ecce Homo Convent (near the large green rectangle north of the Dome of the Rock on the map) we head west, picking up the Via Dolorosa, "The Way of Sorrows." 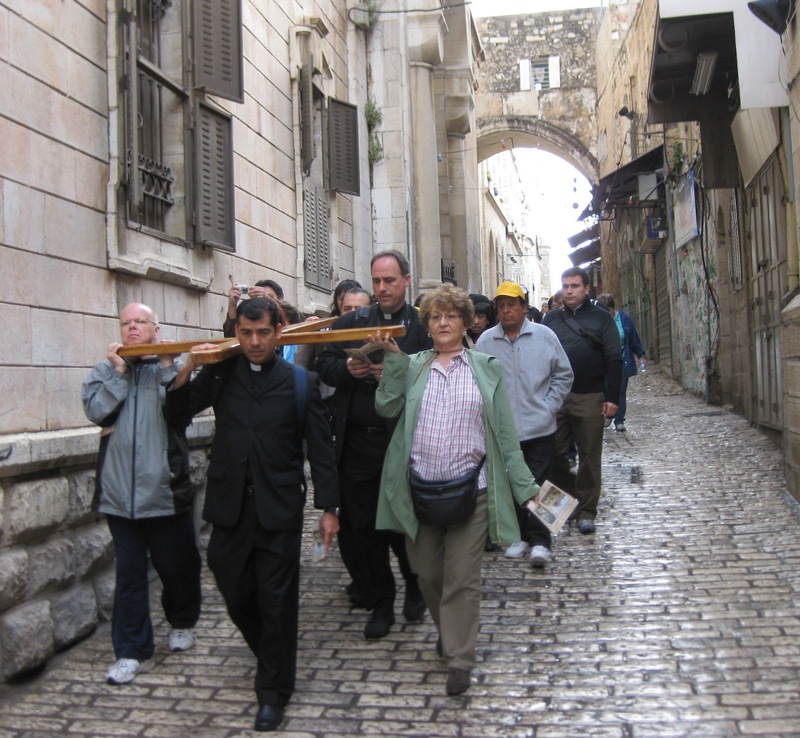 Every morning, we encounter three or four pilgrim groups retracing the steps of Jesus, carrying the cross, singing hymns, and reading the Passion accounts from the Gospels. 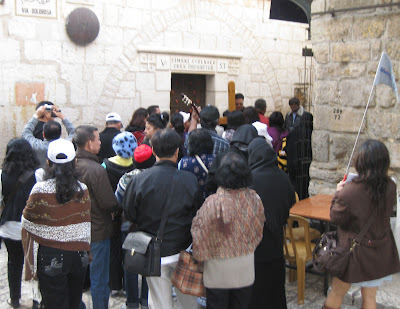 At the Fifth Station a group from Mexico pauses to sing with guitar accompaniment to remember the role of Simon of Cyrene in taking up the cross of Jesus. We have reached Redeemer Church, built upon the foundations of the twelfth-century Church of St. Mary Latina. Here the restored arch from that early structure greets us. Just ahead is the Muristan Market and the minaret of the Mosque of Omar. 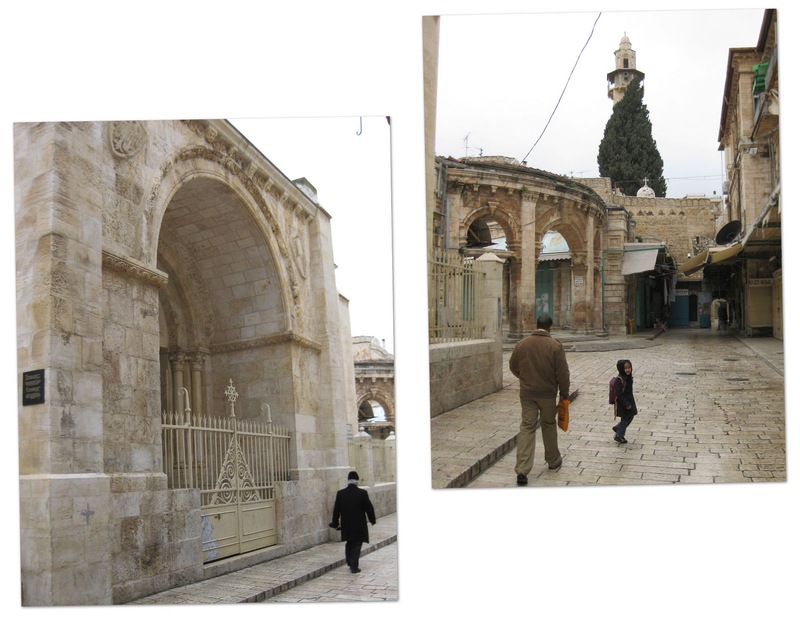 And to the right, the historic Church of the Holy Sepulchre. May your Lenten journey be blessed as you make your way to Good Friday and Easter.